Beacon Hill Bamboo Contour Benches natural appeal generates lasting impressions. 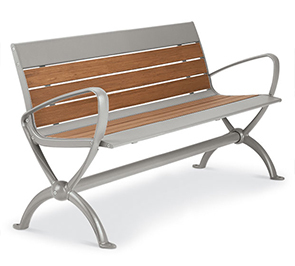 Utilizing eco-friendly and modern artistic elements, these 4' and 6' contoured benches have a one-piece seat design composed of both 1" x 4" bamboo and aluminum accent planks. 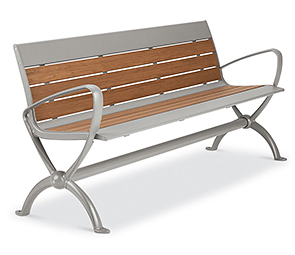 A precision crafted, heavy-duty cast iron frame provides optimum support and features sleek styled attached angular armrests. Engineered for sustainability and long-lasting performance, bamboo planks offer 20% more stability in climate/temperature changes than timber and a superior hardness rating over teak while steel, aluminum and cast iron components are finished in a non-corrosive powder-coating. Built ready to accommodate a variety of environments with the eloquent blend of comfort, strength and beauty offered by Beacon Hill Bamboo Series.